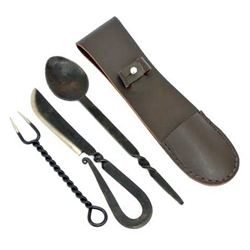 This Medieval cutlery set with pouch, is an ideal piece of equipment for any role player. This set comprises of a spoon knife and fork all made of hand forged twisted stainless steel. This set comes complete with a practical leather carrying case that fits most belts.